Wrapping up a two-day chase since launching from Virginia’s Eastern Shore, a commercial Cygnus cargo craft arrived at the International Space Station Monday with more than 7,200 pounds of supplies and experiments, the second freighter to reach the orbiting complex in 15 hours. A Russian Progress refueling and resupply craft docked with the space station at 2:28 p.m. EST (1928 GMT) Sunday with nearly three tons of propellant, water and provisions for the lab’s three-person crew. Exactly 15 hours later, at 5:28 a.m. EST (1028 GMT), the station’s robotic arm snared the Northrop Grumman Cygnus spacecraft as it flew in a capture position around 30 feet, or 10 meters, below the outpost. NASA flight engineer Serena Auñón-Chancellor was at the controls of the nearly 58-foot-long (17-meter) Canadian-built robot arm for grapple of the Cygnus supply ship Monday. 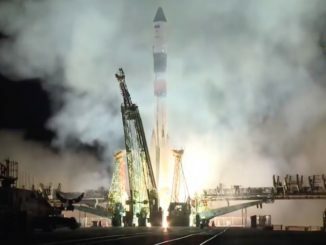 She handed over control of the arm to ground controllers to maneuver the craft to a berthing position on the station’s Unity module, where a series of latches and 16 bolts drove closed to firmly connect the vehicle to the outpost at 7:31 a.m. EST (1231 GMT). The Cygnus spacecraft, named the S.S. John Young in honor of the former Gemini, Apollo and space shuttle astronaut who died in January, is scheduled to stay at the station until mid-February. During the nearly three-month stay, astronauts will unpack 7,215 pounds (3,273 kilograms) of supplies and experiments stowed inside the ship’s pressurized compartment, built by Thales Alenia Space in Italy, then replace the items with trash for disposal. 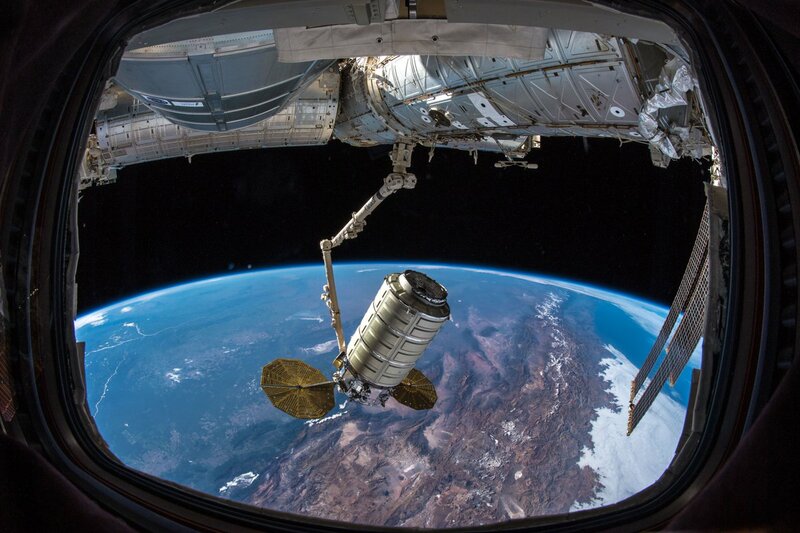 Space station commander Alexander Gerst tweeted photos of the Cygnus spacecraft’s arrival. The back-to-back arrivals Sunday and Monday set a record for the shortest time between arriving cargo craft at the space station. 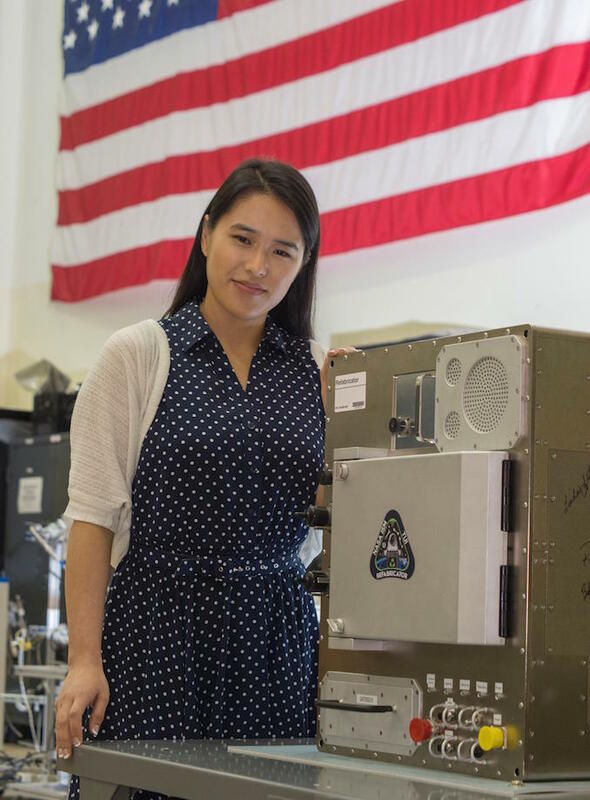 The payloads aboard Cygnus include a plastic recycler and 3D printer built to advance in-space manufacturing capabilities, and an experiment studying how the human body’s ability to perceive motion, orientation and distance changes in microgravity. The recycler and printer, called the Refabricator, is a tech demo aimed at analyzing how future space missions could manufacture tools and spare parts on-board, without requiring resupply from Earth. It was developed by Tethers Unlimited under contract to NASA. The space station already has a 3D printer on-board provided by a company named Made in Space. But that device, intended as a proof-of-concept for 3D printing in space, needs fresh material from Earth to be fed into it. “When all the results were in, we found out that there were no engineering significant microgravity effects,” said Diane Risdon, In-Space Manufacturing Refabricator project lead at NASA’s Marshall Space Flight Center in Alabama. “So now we have our 3D printer, we know that it works in space. The next thing is where do we get the filament? … Do we have to upload that? We’re trying to avoid large masses being uploaded, so we’ve got to find a sustainable source for filament. “On the ISS, we know that there’s multitudes and multitudes of plastic baggies,” she continued. “The crew complains, what do we do with all of these baggies? They also have packaging — plastic packaging — they use food plastic containers, plastic medical devices, so periodically they round up all this trash and burn them in space. Another science investigation aboard the Cygnus spacecraft will examine the processes at the origin of the solar system that led the formation of dust particles that eventually grew into larger objects, leading to the birth of the planets. The experiment, led by researchers at Goethe University in Frankfurt, Germany, “zaps a specially formulated dust with an electrical current and then studies the shape and texture of pellets formed from these steps in the absence of gravity,” according to a NASA overview of the investigation. Loaded with trash after its departure from the station, Cygnus will fire its engine to climb into a higher orbit roughly 300 miles (500 kilometers) above Earth to deploy two CubeSats. One of the nanosatellites is MYSat 1, a 1U CubeSat around the size of a Rubik’s cube. Carrying two payloads — camera and a lithion-ion coil cell battery — MYSat 1 was built by Masdar Institute of Science and Technology in Abu Dhabi with the support of Northrop Grumman Innovation Systems and Al Yah Satellite Communications Company in the United Arab Emirates. The other CubeSat set for release in the higher orbit is CHEFSat 2 from the U.S. Naval Research Laboratory. About the size of a shoebox, CHEFSat 2 is a copy of a CubeSat launched on a Cygnus cargo mission to the space station last November. CHEFSat 2 will test commercial off-the-shelf technologies to evaluate their performance in space, focusing on new radio communications capabilities. Cygnus will lower its orbit below the space station’s altitude after releasing MYSat 1 and CHEFSat 2, targeting an altitude of around 200 miles (325 kilometers) for separation of KickSat 2, a NASA-sponsored CubeSat mission led by principal investigator Zac Manchester at Stanford University. KickSat 2 carries 100 tiny “sprites” — essentially 1.4-inch (3.5-centimeter) square circuit boards with integrated power, computing, sensing and communication equipment. The mission is a follow-up to the KickSat mission that launched in 2014, but failed to release its sprites in orbit. The mission will test the limits of satellite miniaturization, a trend toward affordability widely popularized by the CubeSat design over the last two decades. But KickSat’s sprites are a tiny fraction of the size of a CubeSat. 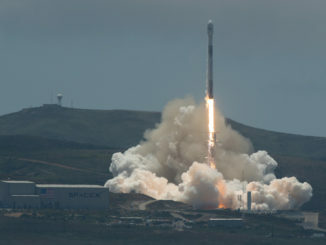 KickSat 2 will eject its sprites at a lower altitude to ensure the circuit boards re-enter Earth’s atmosphere in a matter of weeks, avoiding the possibility of the sprites, which could be difficult to track with ground-based radars, becoming a long-term space debris threat to other satellites. The Cygnus was supposed to carry more than a half-dozen additional CubeSats inside its internal cabin for eventual release through an airlock on the space station. But those were all removed from the cargo manifest, and deferred to future launches, according to Scott Higginbotham, a mission manager for NASA’s Educational Launch of Nanosatellites program at the Kennedy Space Center. Two of the CubeSats originally booked to fly on the NG-10 mission — named UNITE and TechEdSat 8 from Purdue University and NASA’s Ames Research Center — will launch on SpaceX’s next resupply flight to the station no earlier than Dec. 4, Higginbotham said. 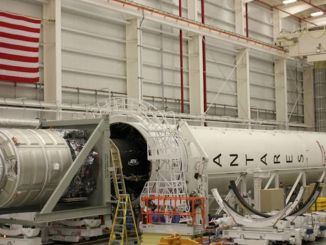 The others will be placed on future Northrop Grumman or SpaceX cargo launches. NG-10 is the first Cygnus flight since Northrop Grumman acquired Orbital ATK, which developed and flew the previous cargo missions under an 11-launch contract with NASA valued at $2.89 billion. Starting with NG-12, set for launch in late 2019, Northrop Grumman will kick off a follow-on commercial resupply services contract, guaranteeing the company at least six additional flights through 2024. SpaceX also launches cargo to the space station for NASA, and the space agency has tapped Sierra Nevada Corp. to begin resupplying the research complex in late 2020.